Besides Cai Rang floating market in Can Tho city and Cai Be floating market in Tien Giang Province, travellers are also urged to visit a lesser-known floating market for fruits in HCM City’s Kenh Te (Te Canal) where poor migrants from the Mekong Delta live in makeshift houseboats and earn their daily bread by selling fruit. Vendors from the Mekong Delta sell fruit on boats along the Te Canal on Tran Xuan Soan Street in HCM City’s District 7. 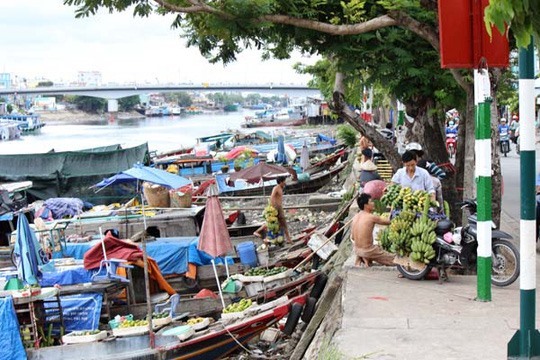 Along Tran Xuan Soan Street in District 7, one can see dozens of boats anchored along the canal selling typical Mekong Delta produce such as banana, coconut, rambutan, mango, and grapefruit. The vendors are mostly from Mekong provinces such as Vinh Long, An Giang, Tien Giang, Tra Vinh and Ben Tre. Tran Van Hung, 42, from Ben Tre said he and his wife have been selling dried coconuts and bananas from their hometown at the market for more than 15 years and spend most of their time on their wooden boat. Like many of the other vendors, Hùng has equipped his boat with a cassette player, a TV set and even a motorbike so that he can deliver to customers nearby.